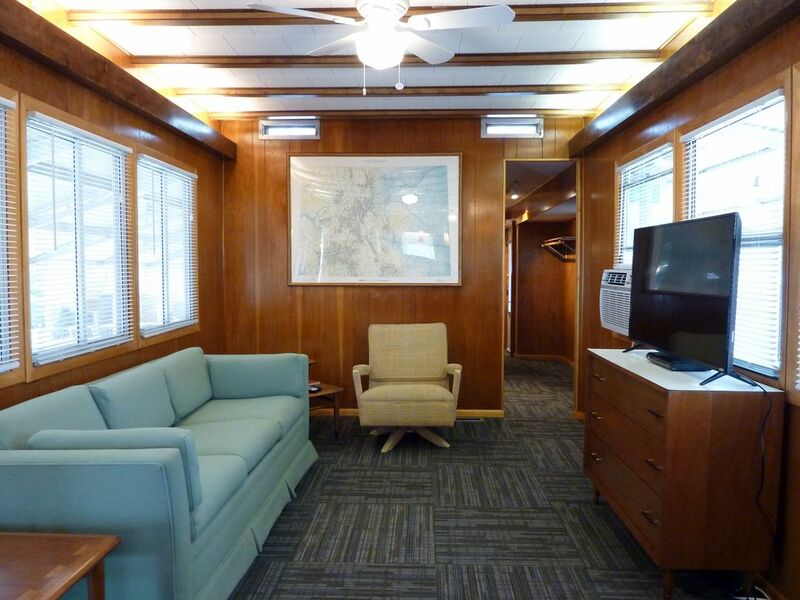 This 1959 Midwest mobile home is a restored example with a lot of original detail. The original wood paneling and cabinets where restored to create an authentic warm environment for our guests. The original fixtures and finishes take you back in time with modern conveniences. Even the exterior paint scheme is original to the trailer since we were able to find the original ads for this specific model. With two bedrooms and sliding doors this mobile home makes for a cozy, vintage getaway with updated plumbing, electrical and a new A/C unit. The property is located in a small mobile home park with only 5 units at the end of a dead-end street. There are vintage chairs for hanging out on the patio and common area with a fire pit and more seating. Had a wonderful time in this adorable, squeaky clean vintage trailer. Exceeded expectations, will definitely stay again when in the area. Thanks so much!!! Very nicely updated and comfortable. My husband and I had a fantastic time in Canon City and loved staying at this vintage trailer. The owner was very responsive to all our questions and needs during our visit. Air unit was cool, trailer was clean, and basically exactly as promised in the ad. We definitely hope to be back and stay here again. Modern amenities in a beautiful era filled trailer. We loved staying here and will again when we come to Canon City. The trailer is beautiful and very comfortable. The owners are easy to communicate with and there is a person on site to help if needed. Neat experience and very comfortable. We loved the 1959 vintage mobile home. It was roomy enough for the two of us. Location was quiet. Check-in was easy! My only suggestion is to plan ahead with the owner for your check out time. We had a schedule to keep so when were ready to leave I called the two telephone numbers but did no one answered. It was also a good while before they responded to my text. We ended up leaving the keys as we found them when we arrived. We loved everything about our week here in adorable #2 vintage trailer house, price is reasonable, kitchen is well equipped (We did not need but could use a blender) everything is clean and comfortable, emails and text answered promptly, two keys and lockbox is good to have. Wonderful experience.